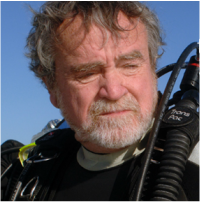 Captain Carl Fismer is one of the most respected and knowledgeable treasure diving professionals in the world. He has worked on the 1715 Fleet on and off for the last few decades and has salvaged millions of dollars from the 1715 Treasure Fleet. His area of expertise is shipwrecks, especially Spanish shipwrecks and has recovered millions of dollars in gold, silver, jewels and other artifacts. He has worked over 300 shipwrecks including the Taj Mahal Treasure and the famed galleon Concepcion. The Concepcion; not to be confused with a ship baring the same name, Nuestra Senora de la Concepcion which sank in 1638 near the southernmost point of Saipan, the second Concepcion sank in 1641, 70 miles off the northern coast of the Dominican Republic upon the coral reefs known as the Silver Bank. "Fizz” as he is known to friends, directed part of the salvage diving of the Santa Margarita, sister ship to the Nuestra Senora de Atocha, which was discovered by Mel Fisher. In 1992, he traveled to Sri Lanka and dived with Sir Arthur C. Clarke of 2001: A Space Odyssey fame, in association with the Great Basses Reef Treasures. In May, 2010, Captain Fismer was awarded the Mel Fisher Lifetime Achievement Award. The Festival will provide a platform to help several charitable organizations who support the local community. Weapons must remain unloaded and securely peace tied at all times so they cannot be removed by patrons. Edged weapons must remain properly sheathed and securely peace tied. No Weapon, including props, shall be pointed at patrons or used in a threatening manner at any time. Failure to comply may result in your removal from the event and or being cited for creating a public safety hazard.